Reuben Bostron was born July 17, 1923, to Conrad and Katherine (Pabst) Bostron in Brush, Colo. Reuben passed Dec. 5, 2018, at the East Morgan County Hospital at the age of 95. He attended Brush High School with the class of 1941. He helped his father in the family farming operation of growing sugar beets and harvesting those beets with four-hitch horse-drawn beet wagons. He left the farm at the age of 19 to "see the world" and he became a bell boy for nine months at the Shirley Savoy Hotel in Denver. Reuben returned to the farm in 1943 and joined his father and brother Dan in the farming business. He leased his first farm at the age of 24 from Alec Lebsock and has been farming ever since. He married Llova (Baldwin), on Feb. 28, 1947, in Fort Morgan and they had two sons Dennis and Curt that joined them in the family farming operation. Reuben and Llova are long time members of the Brush United Methodist Church. 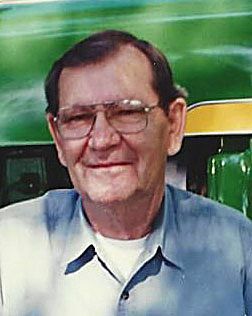 Reuben was a lifetime member of the Elks, was a charter member of the Colorado Corn Growers, director of the Morgan Ditch and Irrigation Company. He won the High Ten Sugar Beet Growers Award several years, as well as, the Colorado Bankers Association, Corn Growers Award. Reuben was extremely proud of the fact that he and his whole family were recognized with the Watrous Outstanding Pioneer Award at the Brush Rodeo in 2014. He is preceded in death by his parents, Conrad and Kate, sisters; Helen Hoffman, Rachel Bostron, brothers; Daniel, Ernest and Donald and great-grandson Waylon Wagers. He is survived by his wife of 71 years Llova, sister Esther Sergeant of Fairfield, Calif., and brother Reinhold of Brush; two sons; Dennis (Jean), Curt (Theresa). Grandchildren; Rebekah Cravens (Greg) of Meeker, Conrad Bostron (Katie) of Fort. Morgan, Melissa Wagers (Jacob) of Woodrow, Jaime Ley (Ryan) of Brush and Crystal Richards (Andy) of Idalia. Eleven great-grandchildren, Grant and Graycee Cravens, Bennett and Ruby Bostron, Liliana and Porter Wagers, Austin and Cody Ley, Kyndal, Trista and Breckyn Richards. At Reuben's request there will be no service at this time.